TOLEDO, Ohio, September 18, 2017 – SSOE Group (www.ssoe.com), a global project delivery firm for architecture, engineering, and construction management, is proud to announce they have been recognized with a Platinum Award from ConstructSecure, a leader in contractor assessment, for their high score on the independent Construction Safety Assessment Program (CS-Safety). Evaluated in both civil engineering and surveying, the firm received a 98-point score out of 100 possible points—a result of SSOE’s safety-always culture. The Contractor Safety Assessment Program reviews a company’s historic safety performance and current safety management systems, normalizing for contractor size and type of work performed for apples-to-apples comparison, to provide a thorough, objective, and consistent evaluation of company performance. The results offer a clear view of the value a company places on safety and a reliable predictor of future performance. Developed at Harvard University, ConstructSecure’s Safety Assessment Program provides the most comprehensive and meaningful analysis available today, reviewing both lagging and leading indicators while normalizing the data for contractor size and type of work performed. “Our exceptional safety track record reflects our commitment to protecting not only our employees, but also our clients and their projects,” shares Scott Goodwin, Corporate Safety Manager at SSOE, recently named a “Safety Hero” by iReport Source. “Safety is an integral part of quality control, cost reduction, and job efficiency—and accidents are almost always preventable. We take a very proactive approach to construction safety by empowering employees to avoid unsafe acts and practices, as well as unsafe conditions”. 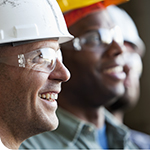 Central to SSOE’s organizational culture is their commitment to the health and safety of employees. So much so, they have a corporate goal to achieve zero recordable injuries each year. With more than 20 offices around the world and over 1,000 employees, it is essential to have fully funded initiatives and programs to ensure proper training takes place. Programs offered include new hire safety training and orientation, continuous training to increase safety knowledge and maintain focus, shared incident reports and near misses to raise safety awareness, weekly safety tips that provide corporate-wide meeting topics, quarterly safety meetings with guest speakers, OSHA training for all technical employees, a safety and construction blog, and additional client- and project-specific safety training as required. In 2017, the firm celebrated several significant safety milestones, including 3 million work hours with no recordable injuries and 9 million hours worked with no lost time injuries*. Additionally, Ford Motor Company recognized SSOE’s China team for “Excellent Safety Performance” for our work on its Nanjing Test Center Project—a result of 1M hours worked with no reportable injuries. A leader in contractor assessment, ConstructSecure provides mobile and web-based applications that are an integral part of an overall safety management system, including safety / financial vendor prequalification, incident reporting and tracking, as well as field, facility, and equipment inspections. ConstructSecure’s assessment products are utilized by global leaders in technology, the top universities in the world, world-class construction managers, and some of the largest commercial developers in the U.S., providing their varying high-profile clients with unprecedented assessment results with loss reductions up to a factor of 10. For more information on ConstructSecure, click here or visit www.constructsecure.com.